Carter Page Johnson enlisted in the army in Virginia in 1876. He was a sergeant at the time of the 1879 Cheyenne outbreak from Fort Robinson, Nebraska. In 1882 he became one of the few non-commissioned officers to rise from the ranks to become an officer. A year later he was assigned to the Tenth Cavalry and sent to Arizona. [i] He later served in Cuba and Philippines. Major Johnson retired from the army is 1909 after 33 years of service. He came out of retirement in 1916 to command Fort Robinson briefly, before his death the same year. For most of the troops there was little glory in this campaign. Their’s was the harder duty, to prevent outbreaks, rather than chase the renegades back onto their reservations. Their’s was the dismal duty to guard mountain passes, water holes, and trails that did not lead to glorious lighting. The Tenth and the Fourth were in close cooperation during this campaign. The troops of the Tenth, under Lebo, Bill Davis, Carter Johnson, Ward, Grierson and others, were holding stations at Mescal Sorings in the Whetstones ; at Calabasas, under the Santa Ritas ; at Crhtenden ; at Tempest Mine, just over the line in Sonora, and at La Noria. The Fourth had stations on the south side of the Huachucas, at Bisbee, at Skeleton Canyon and to the east, with a few troops at Camp Bowie. As 1st Lieutenant, Carter Johnson commanded black soldiers with Troop M of the Tenth Cavalry on a detached assignment with the Cuban forces. “The Battle of Tayacoba was a disastrous American effort to land supplies and reinforcements to Cuban rebels fighting for their independence in the Spanish-American War. Repulsed at the port of Cienfuegos on 29 June 1898, the American force aboard the USS Florida went ashore near Tayacoba the following day. Prior to the drop off of mules, men, and materiel, a small landing party was dispatched to provide reconnaissance on Spanish outposts in the area. Rowing onto the beach, the force crept into the jungle but was discovered by Spanish scouts and soon scathed by enemy fire. Unable to retaliate or even protect themselves, the Americans retreated onto the beach only to find that their boats had been sunk by Spanish cannon fire. Out on Florida, Lieutenant Johnson began organizing rescue attempts. The first four were dispersed by heavy enemy fire and forced to retreat, but the fifth, operating under cover of darkness and crewed by only four men of the U.S. 10th Cavalry, successfully located and repatriated American and Cuban survivors. Once the U.S. fighting men were safely aboard Florida, they promptly left the bay of Tayacoba. The rest of the mission was more successful. There is another view of this flag-rasing incident, from another Regimental history. In October, 1906 Capts. Carter P Johnson and Robert G. Paxton of the Tenth Cavalry were sent from Fort Robinson to investigate and negotiate with a band of about 116 armed Ute Indians that refused to return to the Uintah Reservation. On October 31, Captain Johnson made arrangements through interpreters for a conference with the Utes between the Army and Indian camps near the Powder River. After difficult debate and discussions with Indians, they agreed to go the Fort Meade while a delegation was sent to Washington to request a transfer to the Cheyenne River (Soiux) reservation. Captain Johnson was in immediate charge of the Utes at Fort Meade and oversaw the ultimate transfer of them to the Cheyenne Reservation by June 30, 1907. On March 9, 1916, a large force of bandits under Pancho Villa raided Columbus, New Mexico. burning several buildings, killing eleven civilians and nine soldiers, and wounding many others. In retaliation the Punitive Expedition was organized under Gen. John J. Pershing, and additional troops hurried to the border. On March 14 the remaining Twelfth Cavalry troops at Fort Robinson, quickly left the post for Columbus. After the sudden departure, only eleven soldiers and five civilian employees remained at the post. A military station, regardless of its garrison, needs a commanding officer so on March 31, Major Carter P. Johnson came out of retirement to command the almost vacant post. This assignment was Johnson’s fifth tour of duty at Fort Robinson. He had been there in 1877 as a Third Cavalry private at the time Crazy Horse was killed. In 1878–79 he again served at the post with the Third as a corporal during the ill-fated Cheyenne Outbreak. In 1882, he was appointed as a second Lieutenant in the Fourth Infantry and again assigned to Fort Robinson. 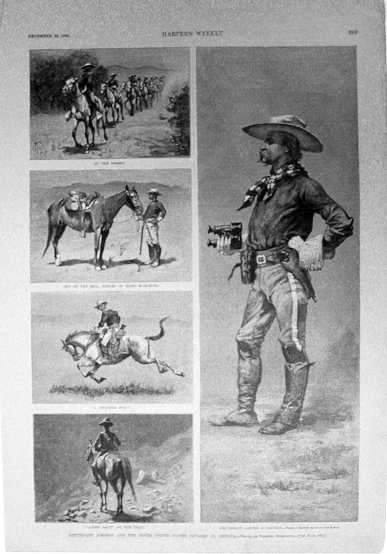 The next year Johnson transferred to the Tenth Cavalry, where he spent some years with the regiment on duty in the Southwest. Today, Carter P Johnson Lake is located on the grounds of Fort Robinson, Nebraska. 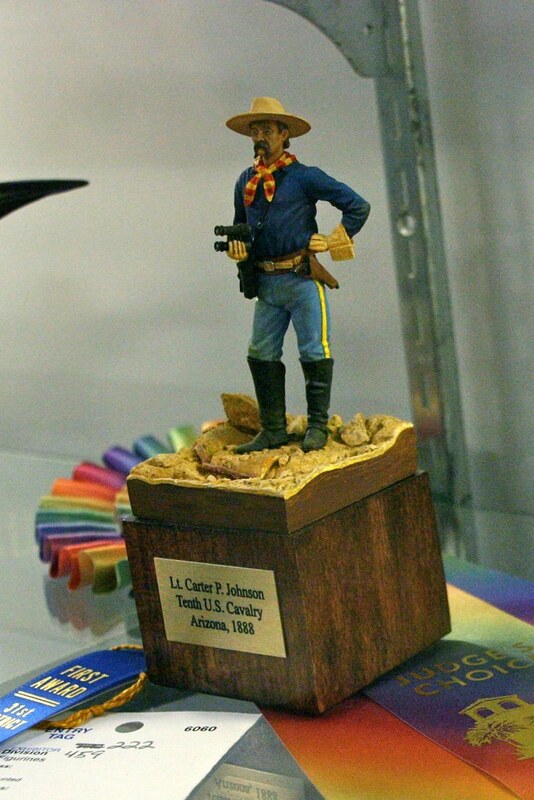 The SCAHMS figure portrays Lt. Carter P. Johnson while he served with the Tenth U.S. Cavalry in Arizona, 1888 and is based on a sketch by Fredrick Remington that appeared in the Harper’s Weekly. It was sculpted by Mike Good. [ii] The history of the Tenth Cavalry, 1866-1921 – compiled and edited by Major E.L.N. 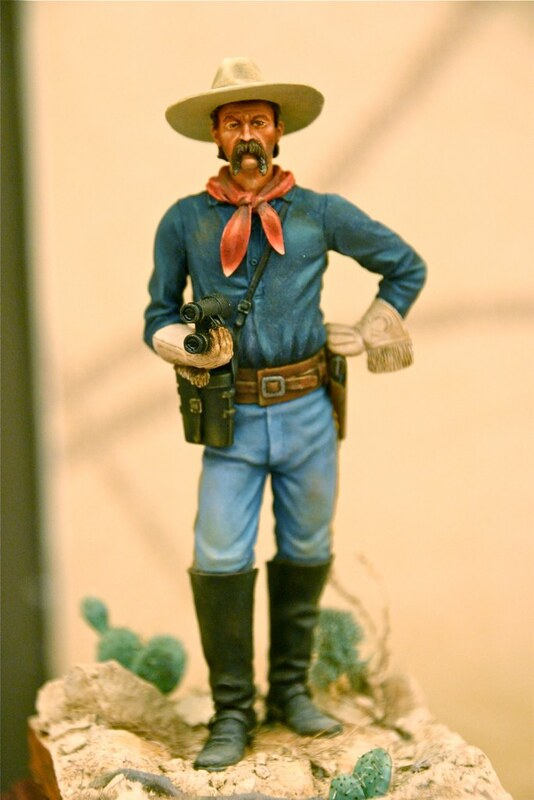 Glass, Tenth Cavalry. [iv] Battle of Tayacoba from Wikipedia. [viii] Annual Reports of the Secretary of War, Vol. 3 1907. Check out NY Times November 1, 3 and 7, 1907 for further adventures of Carter Johnson. Probably one of his most notable efforts at negotiation with the Utes. Would appreciate if anyone knows the whereabouts of the report of his meeting with the Utes on Feb. 17, 1907 at Fort Duschene, Utah.